Double bolt padlocks are less common than those with a single bolt, but in some situations they make a real difference in terms of ease of use and security. Padlocks with dead-bolt type locking, like those for roller shutters, normally have only one dead-bolt and a single slot. 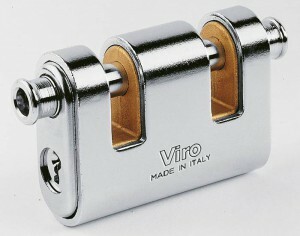 Dead-bolt padlocks, such as the Viro Panzar, usually have a single dead-bolt and a single slot. However, if one thinks about it, there are many situations in which the padlock must lock not just one, but two elements: the 2 ends of a chain, the 2 panels of a double door, the opening side of a door and a fixed wall element, etc. It is in these cases that a double bolt padlock is very handy. As the name suggests, this is a padlock with 2 slots and 2 dead-bolts. The Panzer in the version with 2 dead-bolts and 2 slots. Each slot can then be used to lock one of the two elements to be secured. What’s the difference compared to a single bolt lock? 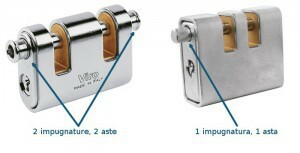 The advantage which can be immediately seen for everyday use is that in order to open the padlock it is not necessary to release both slots, but merely one. This means that the padlock can remain easily attached to the other end without having to hold in your hand, close it or place it somewhere Just think of a chain: the 2 ends of the chain are inserted in the 2 slots of the padlock and to open and close it one merely needs to release just one slot, leaving the padlock attached to the other part. This might only appear to be a minor issue, but in the long term it can make a difference for an operation which possibly needs to be repeated several times a day. And again, think of a double door, like the one used to close certain garages. 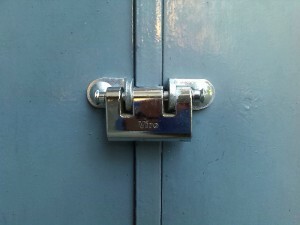 A padlock with 2 dead-bolts is extremely useful on double doors, as it can be left attached to one of the two doors. In this case, the convenience is even more evident: by leaving the padlock attached to the door which is opened the ease of use is virtually the same as that with a rim door lock. But, compared to normal locks, a good padlock can be stronger. Another typical situation is that of the doors of a truck. Having the padlock which remains attached to a door instead of having to hold it in your hand is extremely useful. 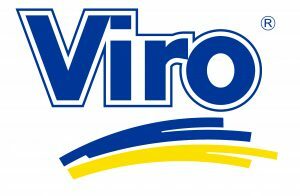 However, in the case of the vans it is still best to use a lock specifically designed for that type of vehicle, such as the Viro Van Lock . The double bolt padlocks should not be confused with the cheaper ones which do have 2 slots but with both closing on a single dead-bolt. The difference is immediately visible; padlocks with double bolts have 2 grips, whilst those with a single bolt only have one. 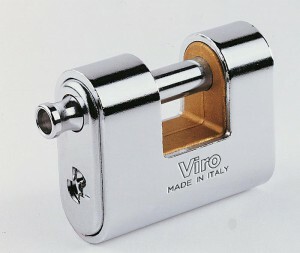 There are also padlocks with two slots but with only one bolt (and, therefore, only one grip) which do not have all the advantages of a double bolt. 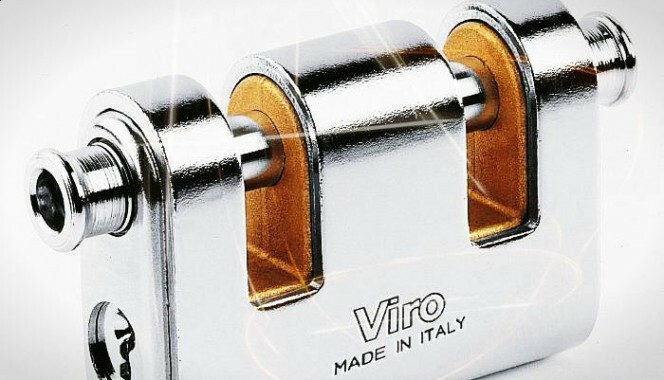 Double bolt padlocks are not only more convenient to use, but are also stronger. Compared with single bolt padlocks, they have twice the number of latches (2 rather than 1) and the bolts, since they are shorter , suffer less from the leverage effect which can be utilised with burglary tools. The slots are also narrowerand it is therefore more difficult to introduce levers or cutting tools to attack the bolt. Double bolt locks are one of those practical products which one can remain unaware of, but once discovered you will be unable to do without them. This entry was posted in Padlocks and tagged padlock on 16 June 2014 by Mara Rossi.